I found this little booklet among my mother-in-law’s papers. I presume it belonged to her father. Does any one know anything about this club? If you can help, please leave a comment below. The Brighton Special Constabulary came into being during WW1 but the regular forces were merged with that of Hove during WW2 to become No 3 District. After the war it was not until 01st April 1947 that the Brighton Special Constabulary reverted to its peacetime role. 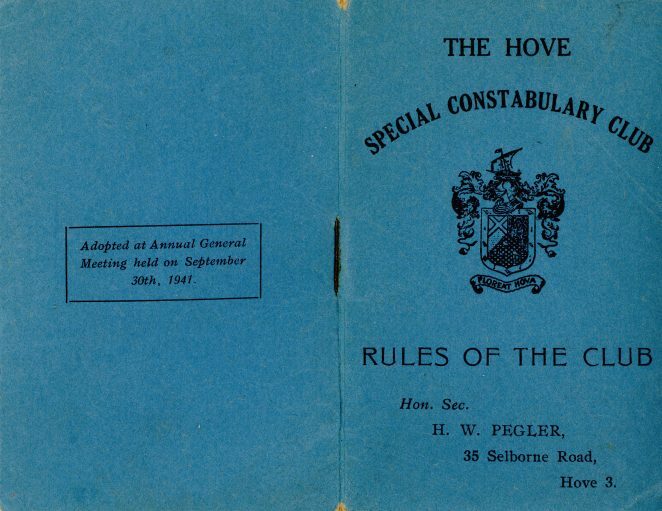 Prior to the war Hove had been separately administered but after April 1947 it became part of the East Sussex Special Constabulary. J.M. Hunt was the Hove Divisional Superintendent and the Special Constabulary Offices and Club were located at 6, Norton Road, Hove.